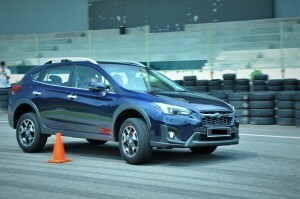 The new Subaru XV can be easily mistaken for the Impreza, particularly the hatchback (which looks more like a wagon) variant. And this is how it stands out in a market of soft crossovers playing dress-up as rugged four-wheel-drive SUVs. 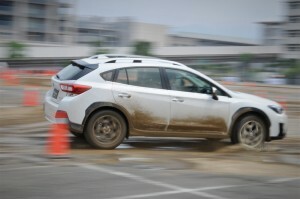 Subaru took things a little differently with the XV. 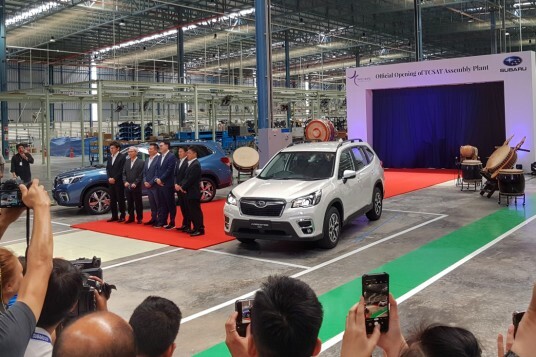 Instead of putting out another box-type vehicle, it took one of its cars, increased its ground clearance with jacked-up suspension, slapped some rugged cladding on it and voila! You get a rugged urban vehicle that also plays well off the tarmac, without the high R&D costs to produce a completely new vehicle. The Impreza is already a four-wheel drive anyway. 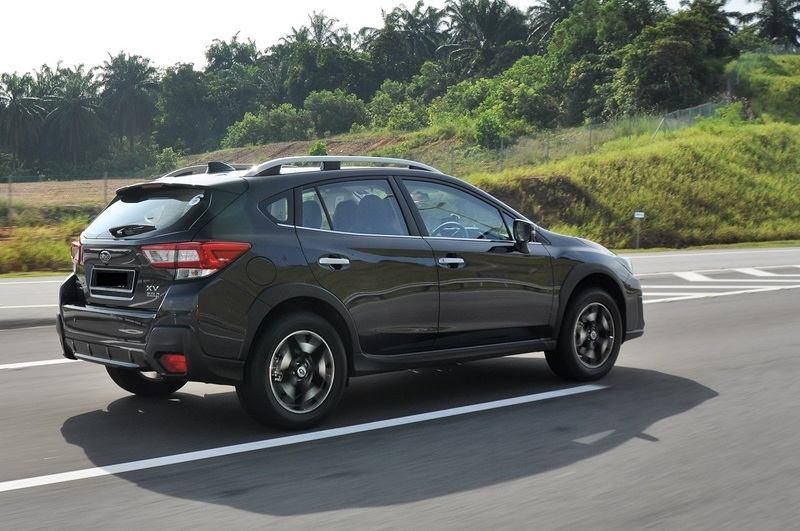 The unit we reviewed is the range-topping Subaru XV 2.0i-P. 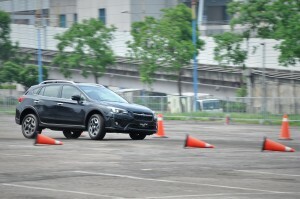 The differences with the cheaper 2.0i variant are mainly cosmetic as Subaru made sure its safety features are available to both. 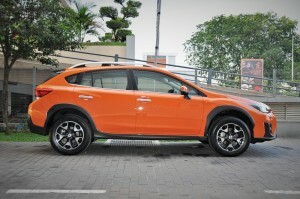 A cursory look at the old XV will lead you to believe the new XV is a facelift. And this is how Subaru deceives with its evolutionary take of the XV design, even with its incorporation of its new ‘Dynamic x Solid’ philosophy. 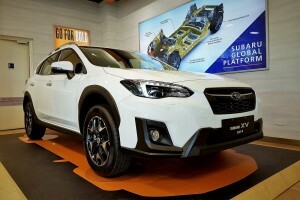 The new XV is actually built on the new Subaru Global Platform (SGP) and when the old and new are placed beside each other, you will see that the new XV has benefitted from and increase in size; it is now a little longer and wider, with a lower centre of gravity but still keeping to the same height and ground clearance. 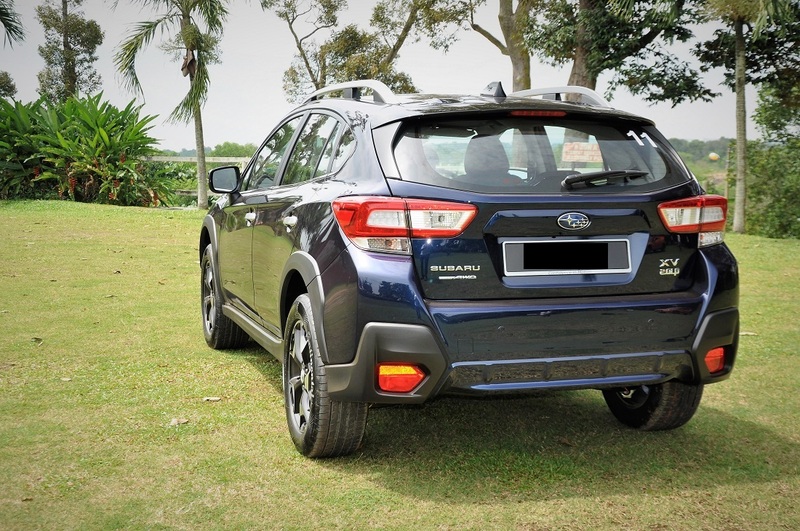 With new elongated headlamp and tail lamp design, reprofiled bumpers and front grille, the XV gets a more chiseled but familiar look despite its growth in size. 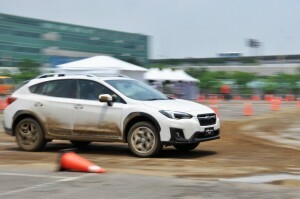 The bigger SGP platform has enabled Subaru engineers to design a larger cabin for better passenger comfort. Improvements include better shoulder room for the front passengers, and extra legroom for the rear. The downside for me is the minimal increase in boot space over the old model. 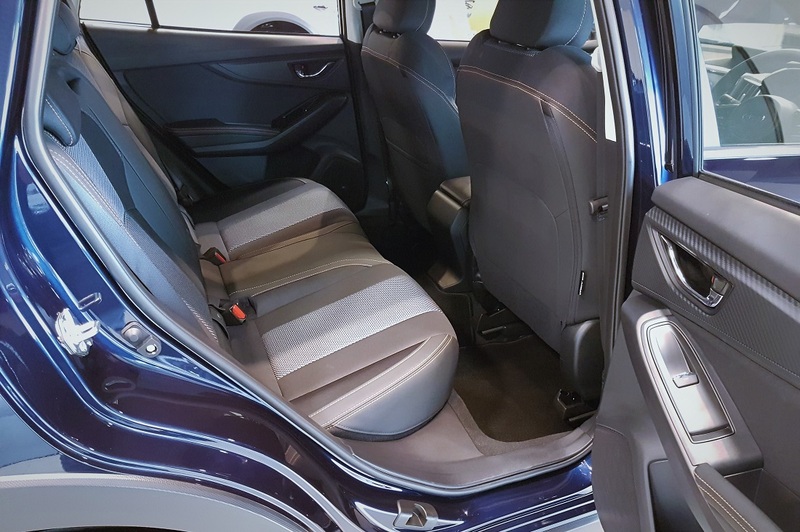 It may only have 345 litres of cargo volume but the extra vehicle width has allowed the designers to carve out a wider boot opening for better access. And if you are a golfer, you will be glad to know that the boot easily fits three golf bags without them blocking driving visibility. 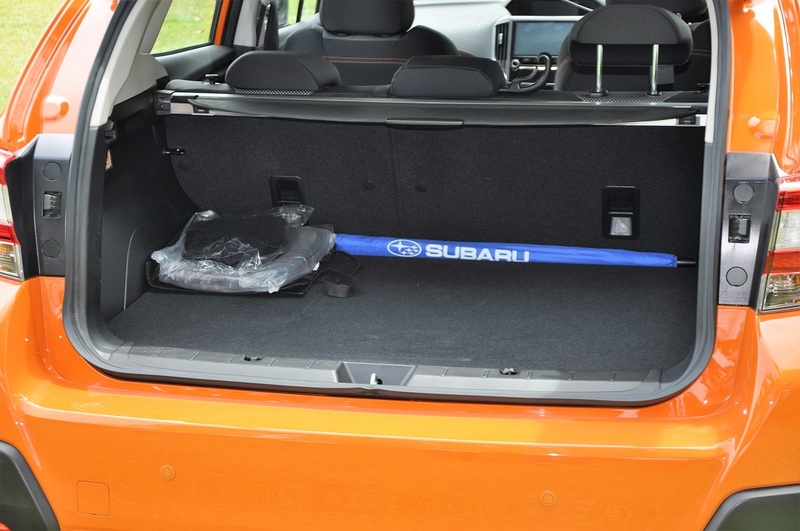 The retractable tonneau cover keeps the contents of your cargo space under wraps and it and can be easily taken out and stowed in the boot when you need to carry bulky items. 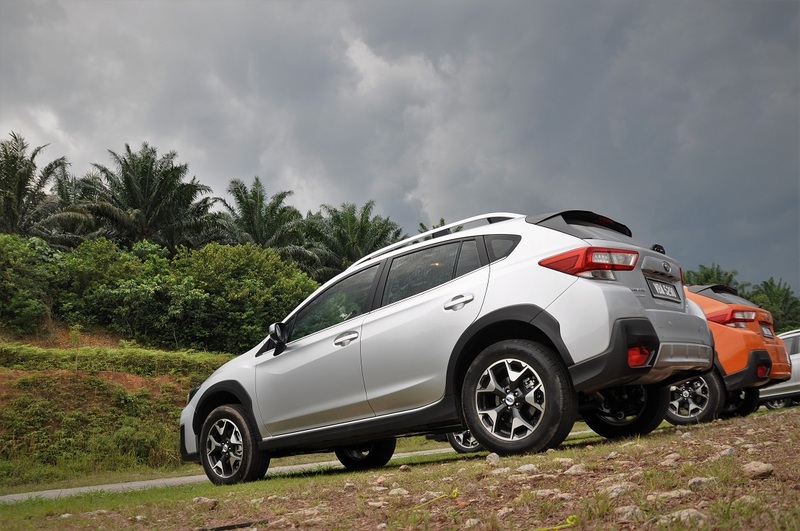 If the boot still isn’t big enough for you, the XV has roof rails as standard and roof-mounted storage is easily accessible thanks to the low roof height. A flat platform at the base of the rear seat also lets you safely and easily stand to access rooftop storage. Speaking of space, the switch to an electronic parking brake has freed up more space in the front for cup holders. 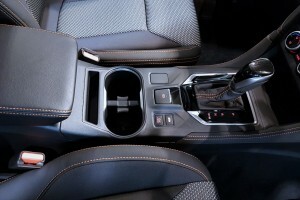 The Impreza link is not just on the exterior but the interior as well. 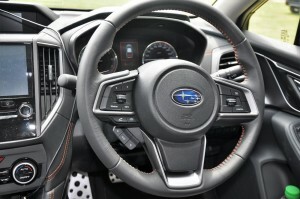 The dashboard is also derived from the Impreza and elevates the interior quality and ambience compared with the previous XV. The Impreza-derived steering wheel is comfortable to hold and holds easy access to various features like audio, cruise control, and vehicle information. 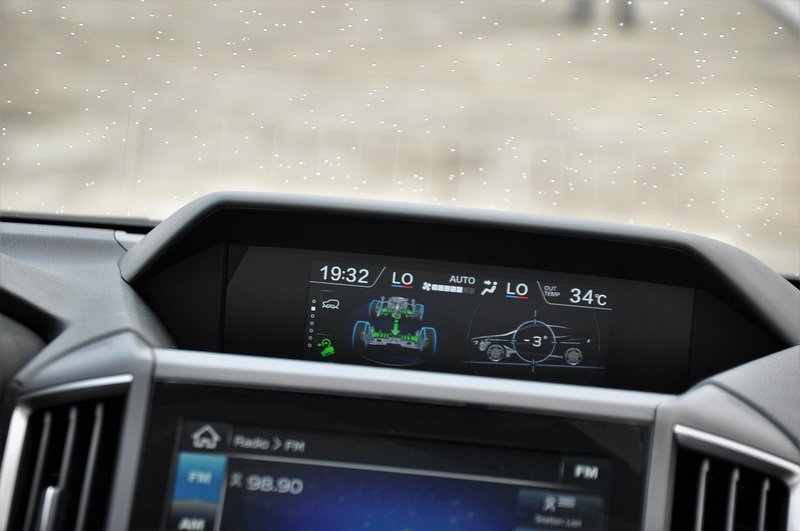 Key vehicle information such as trip data, vehicle pitch angle, temperature and climate control, is displayed on the on the 6.3″ multi-info display that sits atop the dashboard. The other display screen is below and is an 8″ touchscreen entertainment unit that serves up entertainment and navigation. 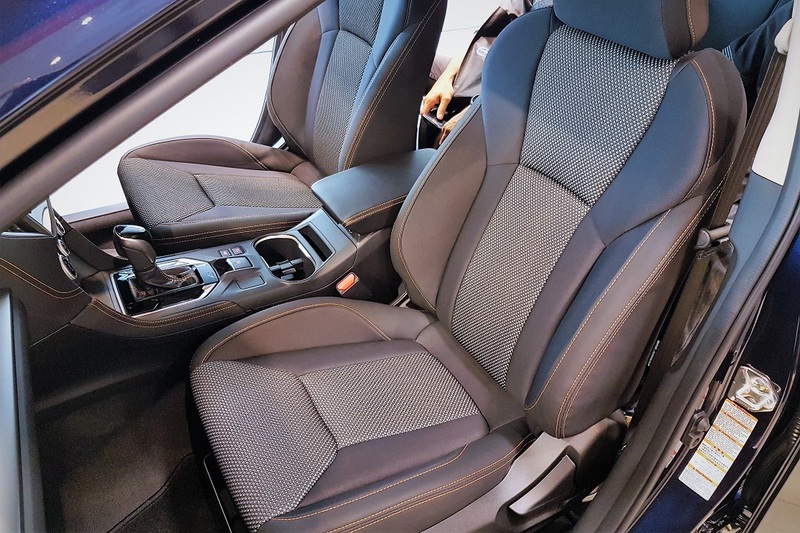 Despite this unit being the premium variant, the seats are not full leather but are mixed with fabric and accented with orange stitching like the rest of the interior. 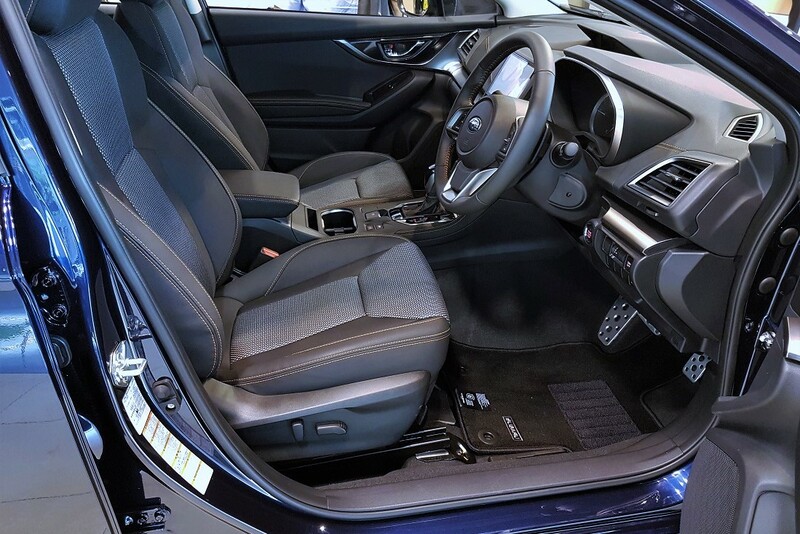 Only the driver’s seat is electrically adjustable. The larger platform base also allows for a significantly bigger fuel tank i.e. 63 litres vs 50 litres of the old one. 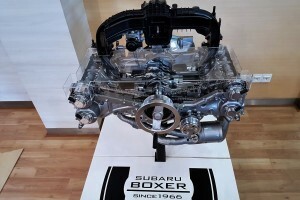 Standard in any modern-day Subaru is its boxer engine which sits low in the engine bay thus giving the car a lower centre of gravity and more stability. 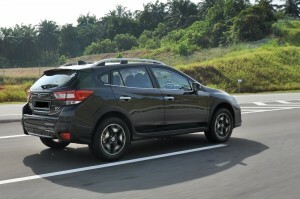 The new engine in this XV may still be a 2.0L 4-cylinder unit but this one has had a lot of revisions done. The new engine is 12 kg lighter, has direct injection and is slightly more powerful with 156 PS and 196 Nm. This power is sent to the famed Symmetrical All Wheel Drive system by an improved 7-speed Lineartronic CVT which has been lightened by about 8 kg. 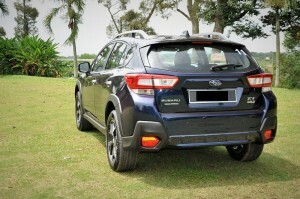 The new platform has given the XV more than just extra space and improved looks. Torsional rigidity has improved by about 70% and allows for better driving composure and control. 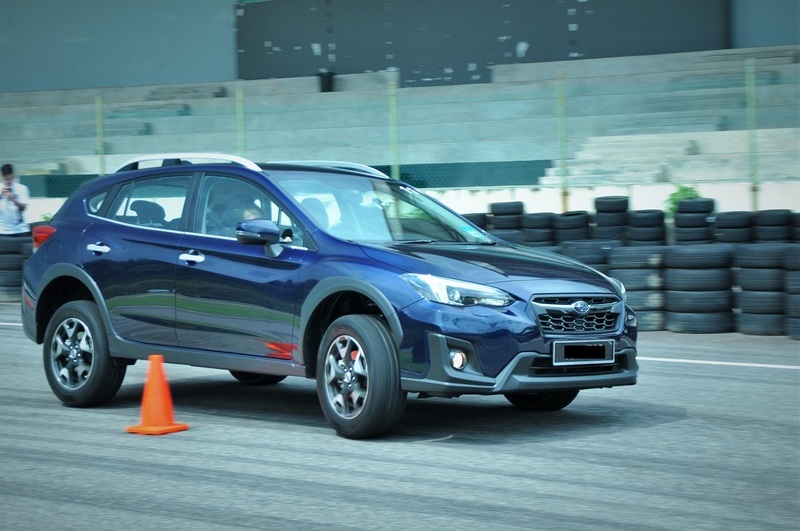 Car control also comes in the form of the brand’s signature Symmetrical All-Wheel Drive system, and while you may argue that not everyone takes their vehicles off-road, it is a very appreciated feature especially when driving in the wet. 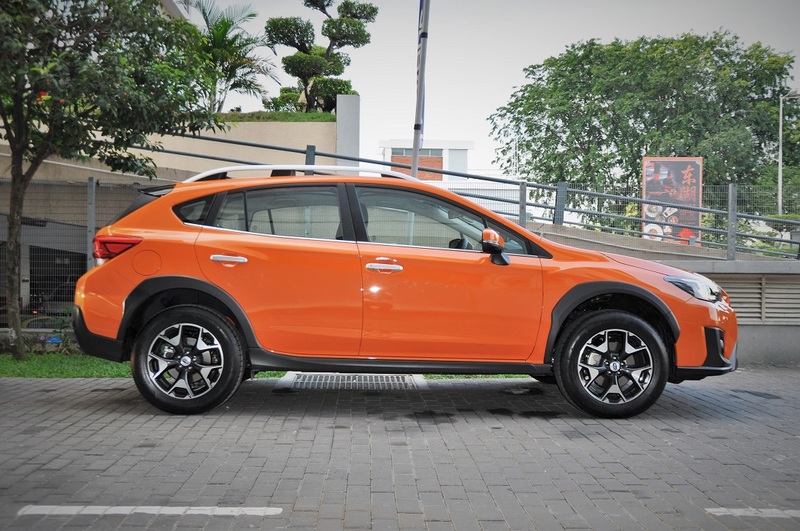 For those who do want to take the XV off-road, the X-Mode function works with the all-wheel drive system to control the power delivery to the wheels and brakes. We are of course not talking about such extremes as the Rainforest Challenge or the Dakar Rally, but that muddy or sandy road can now be traversed without much worry. 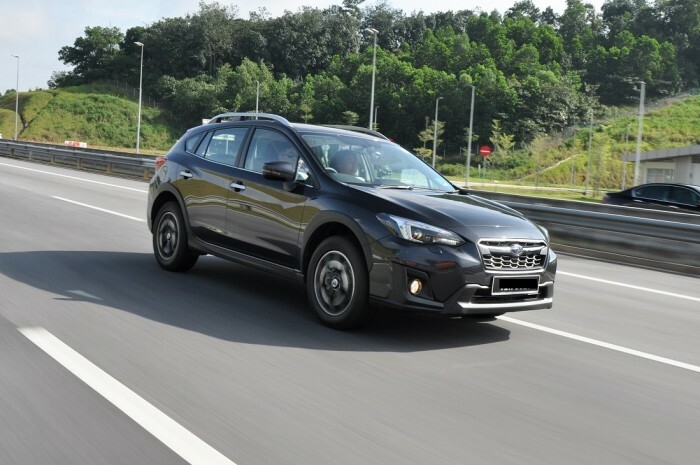 Back on sensible tarmac, the XV feels agile and surefooted thanks to the all-wheel drive system and Active Torque Vectoring which minimises wheel spin. 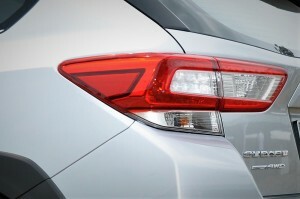 The naturally low centre of gravity afforded by the flat boxer engine also contributes to the car’s stability. In terms of comfort, the new XV has improved noise insulation for a quieter cabin. The suspension system has also been tweaked to offer a more supple ride that is still firm enough to take corners in an aggressive manner. 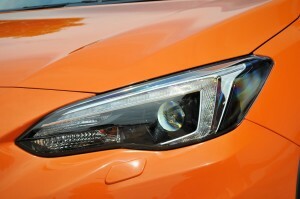 The ride and handling is notably better than the previous model which itself was not too bad for its time. 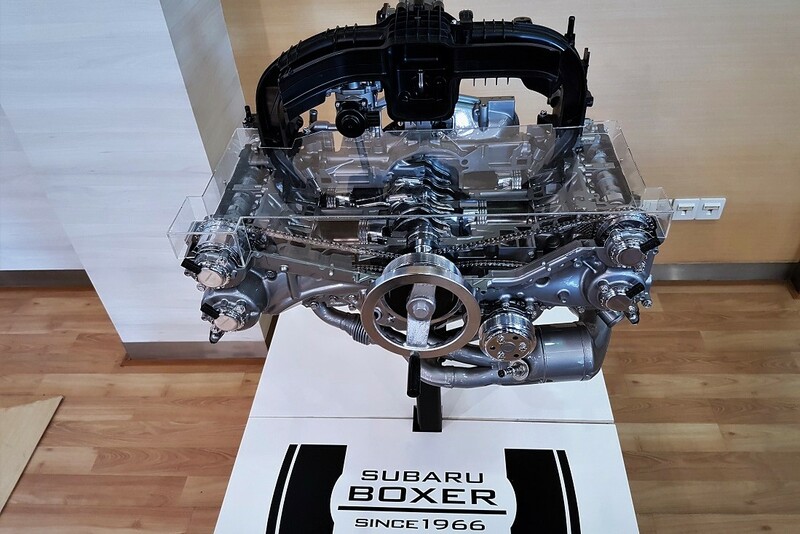 What some people will pick on is the company’s decision to use a CVT (continuously variable transmission) instead of a conventional automatic transmission. 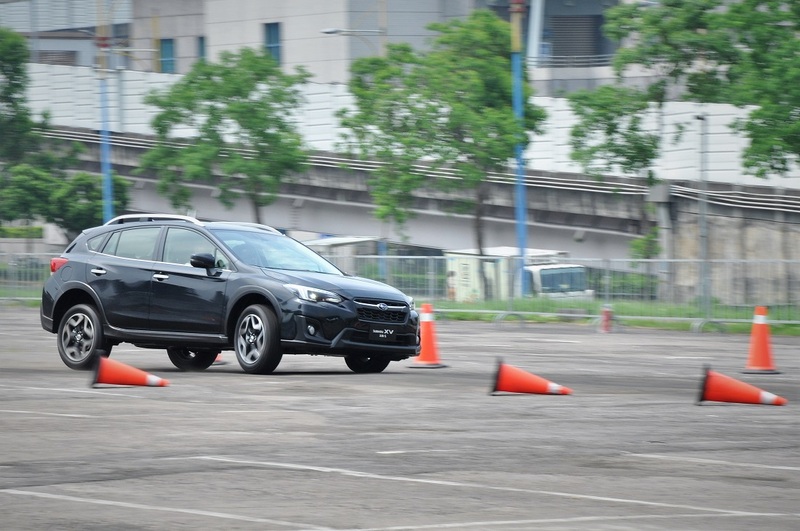 Thankfully, Subaru’s Lineatronic CVT is one of the better ones in the market and has a ‘stepped’ feel that mimics the sensation of a conventional gearbox. CVTs are typically used to aid fuel economy, so that seems like a plus. 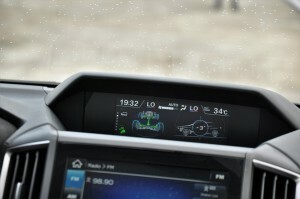 The official average fuel consumption is 7.3 litres per 100 km. 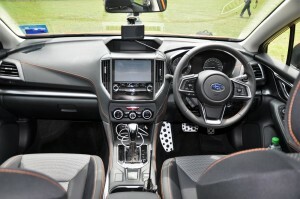 Other notable features include Vehicle Dynamics Control System, Hill Hold, Brake Assist, Brake Override, paddle shifters, rear view camera, keyless entry and start, steering responsive headlamps, front, side and curtain airbags, driver’s knee airbag, dual zone climate control and PIN code access. The last feature is a useful one if you are the active type as it allows you to lock the key fob inside the car and go off for your activities. You will not have to worry about losing your key or damaging it on a hike, and you can later unlock the car with a PIN code. I would rate the Subaru XV the best all-rounder in its segment and it should please any one (or any family) with its capability and value. 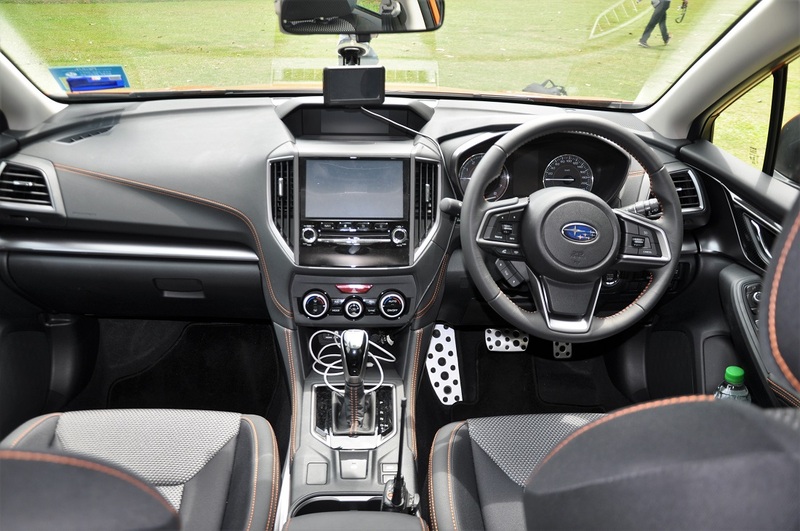 It does not have ultra fancy toys like 20 speakers or head-up display, but there is enough to keep you satisfied. It can also take on much tougher terrain than the usual soft-roaders, so that picnic at that particular secluded beach seems more possible now. 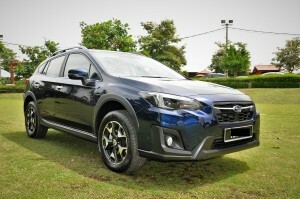 The Subaru XV 2.0i-P retails for RM137,788 (on the road without insurance) and covered with a 5-year warranty and 5-year service labour. 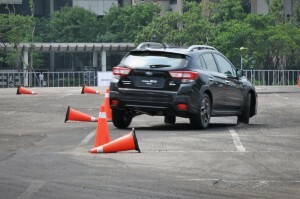 It currently shares the same retail price with the larger Forester, but dealers do occasionally have deals on the XV.